If you follow a losing team long enough, the crappy seasons tend to all blend together. But if the 2016 Chicago Bears want to be remembered, they can make it happen this week by beating the Packers. The Bears have been a losing team for most of my life, but there are a few teams I remember fondly. I remember the 2003 team because Charles Tillman ripped a pass out of Randy Moss’ hands and cost the Vikings a playoff berth. I remember Brian Urlacher running all alone down the field after intercepting Brett Favre in a 35-7 Bears win in 2007. I remember the 2015 Bears beating all odds by beating the Packers on Thanksgiving when Favre was being honored at halftime. Those are the bad teams I remember positively and this year’s team has a chance to join them. This team has a chance to be more than just another losing Bears team. They won’t make the playoffs, but they can have a significant say in who will by knocking out their most hated rival. All the buzz about the Packers being the team nobody wants to play could end this week. If the Bears pull off the win, John Fox becomes unfirable, Matt Barkley clinches a chance to compete for a job and the sour taste that this season is threatening to leave us with can go away. For the Bears, making this season matter is all about this Sunday. They have to do one thing: beat Green Bay. The last time the Bears had a rookie as good as Leonard Floyd was when Brian Urlacher took home the Defensive Rookie of the Year award. Floyd needs to get stronger and work on his technique, but he’s such a special athlete that the other stuff doesn’t matter that much right now. He can get anywhere on the field and is just too quick for most offensive linemen to handle in a phone booth. Floyd didn’t have any sacks on Sunday, but he was great. He drew a holding penalty, should’ve drawn two more, forced an intentional grounding penalty and provided the pressure that led to sacks for two of his teammates. He was all over the field. Like Urlacher when he was a rookie, Floyd is still learning the intricacies. He’s already passed two really good veterans in Pernell McPhee and Willie Young as the best pass-rusher on the team. Once Floyd puts it all together, he’ll be one of the best in the league. I’m not sure there is a single member of the Bears secondary who should be starting next season. That’s unlikely, but they have to bring in two new starters. I think Deon Bush, Adrian Amos or Harold Jones-Quartey could develop into a good starting safety, but I wouldn’t bet on all three of them and I surely wouldn’t bet on two of the three. I feel the same about Bryce Callahan, Cre’Von LeBlanc and Deiondre Hall. The Bears need two new starters in their back end when next season opens. If they can accomplish that, we could see their defense take a big step up from good to great. • I had Floyd down with eight quarterback disruptions, while McPhee added four. I thought McPhee’s season was pretty much over, but he was as active as he has been since the middle of last year. • My biggest question regarding Matt Barkley is his ability to handle pressure, but we saw it a number of times on Sunday. 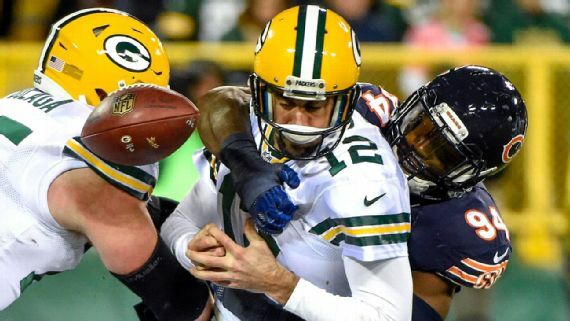 He wasn’t under constant pressure as the offensive line did a good job once again with just seven disruptions allowed, but when he was pressured, he stepped up and found a throwing lane. Most importantly, when the game was on the line, Barkley made big throws. He just might be OK.
• Josh Bellamy doesn’t get enough credit for the tough catches he made, making two on inaccurate passes on Sunday, but his drops are killers. Last week, he left 43 yards and two crucial first downs on the field. This week, the Bears replace him with Alshon Jeffery. Bellamy did what he could, he just has stone hands. His play on special teams makes him well worth the roster spot, however. First a Tribune clown says the Bears are, might be, or could possibly fire Vic Fangio. Then Jason La Canfora tells us Bill Polian is talking to the Bears. Two reports that, as far as anyone can tell, were completely made up. I have very few sources in the NFL but two of them are really close to the Bears coaching staff. Fox and Fangio aren’t buddies, but they don’t dislike each other. Fangio is given freedom to do what he wants and the Bears are giving him good players. Could he leave? Sure. But Mike Mulligan wasn’t even convinced in his own story, so that should tell you what you need to know. The Polian story was funny. Schefter called his ESPN co-worker and ended it on the spot. If the Bears wanted to hire Polian, they could’ve done it before they hired Pace. They didn’t. Maybe Fangio leaves and they end up bringing Polian in to be Ryan Pace’s boss, but there’s no evidence that either are on the way to happening. Those reporters just jumped the gun. Here’s a list of people to trust: Adam Schefter, Brad Biggs and Jay Glazer. Other than that, take it with a grain of salt.